A high-performing liquid foundation that helps you face anything. Studio Skin evens skin tone and never settles into pores and lines. Find your perfect match among 40 shades (that won?t oxidize) & a broad range of undertones. It?s the same great formula?now proven to last 24 hours! What else you need to know:This oil-free foundation is powered by flexible, breathable polymers that move with your skin for a comfortable, flawless look that lasts all day. Studio Skin is infused with nourishing hyaluronic acid and won?t oxidize or cause breakouts. It easily builds from medium to full coverage and gives you a fresh, natural matte finish. This foundation is also transfer-resistant, which means it stays right where you want it for 24 hours. Smashbox developed 40 shades of Studio Skin ranging from very fair to very deep using shade-specific undertones.The foundation easily builds from medium to full coverage and gives a natural-matte finish. Formulated without parabens, sodium lauryl sulfate, phthalates, silicone, oil and talc.This foundation is also vegan.Like all Smashbox products, Studio Skin is cruelty free. Explore the entire range of Foundation available on Nykaa. 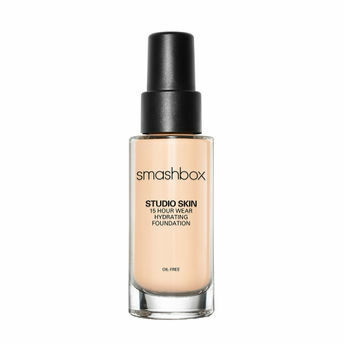 Shop more Smashbox products here.You can browse through the complete world of Smashbox Foundation .Alternatively, you can also find many more products from the Smashbox Studio Skin 15 Hour Wear Hydrating Foundation range.